Come on down to One Fat Frog Restaurant Equipment and check out the ridiculous selection of used hot line counter top restaurant equipment. Counter top restaurant equipment is perfect for food trucks and smaller kitchens. The high school quarterback of One Fat Frog Restaurant Equipment’s countertop line is the used flat griddle. 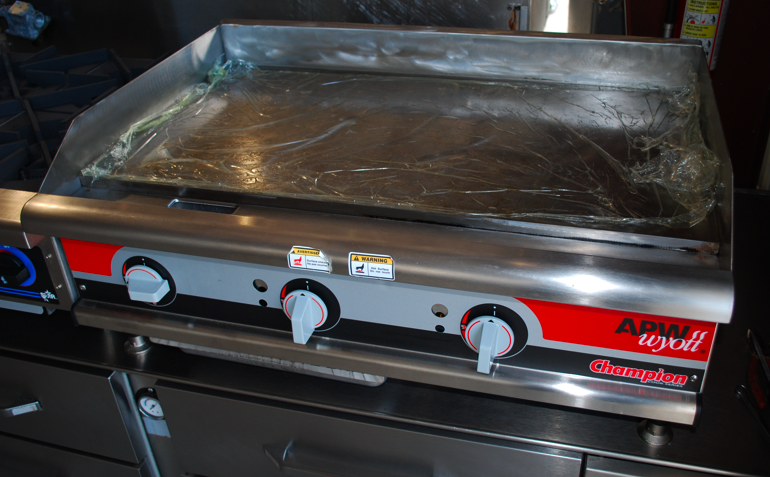 One Fat Frog Restaurant Equipment has several used flat griddles available, including a 24″ and a 36″ flat griddle. Countertop flat griddles are perfect for cooking just about everything from breakfast to lunch. Flat griddles are the best for egg sandwiches, pancakes, burgers, chicken, bacon, sausages, etc. I’m getting hungry as a starving moose just writing about it! Used flat griddles are very easy to clean and maintain. Most on gas and One Fat Frog Restaurant Equipment offers free gas conversion from liquid propane to natural gas and vice versa. One Fat Frog Restaurant Equipment will work with you to make sure you can afford all of the used commercial restaurant equipment you need without having to break the bank or hold up a stage coach. One Fat Frog Restaurant Equipment welcomes quick cash and package deals towards the entire stock of used commercial restaurant equipment – including used flat griddles. One Fat Frog Restaurant Equipment can even get you financed! One Fat Frog Restaurant Equipment is worth the drive! People come from all over the east coast to shop at One Fat Frog Restaurant Equipment!